I Turned 15 Years Old on Sunday! Pentecost is our anniversary into the Catholic Church. Today I wept again as I remembered God’s mercy and faithfulness as he brought us into the fullness of the Catholic Church. Our past as Protestants was like a nursemaid that brought us all the way home to the Church. As a Jew is considered a fullfilled Jew by becoming a Christian, I am now a fulfilled Christian by becoming a Catholic. At the altar of a Catholic Church 15 years ago some of us were baptized, all of us received confirmation (except little Emily who was only 2 years old at the time), and we received the Body and Blood of our Lord for the first time. Needless to say we were all in tears. We still have the same priest and he gave us his blessing again today on our “birthday” and I was again in tears. Thanks Fr. Ed Fride. When we came into the Church our family numbered six (Janet, myself, Cindy, Jesse, Charlotte and little Emily). Today our family numbers sixteen (son-in-law Ben with Dominic, Damian, Gianna and Sebastian; daughter-in-law Anna with Joshua, Maria Faustina, Samuel and Elizabeth Rose). Look what God got started :-) and what a great day to celebrate. Happy Pentecost everyone! Thanks to you I’m now intellectually Catholic and I hope soon, as Patti Bonds has told me, to be open to where God is leading me! This is my first time on your website. A friend told me about you this AM as we chatted about the wonderful converts who are bringing great power to us cradle Catholics. As I went through and read some of you articles the one on Grandkids caught my eye especially when you said baby Gianna was to small to be included in the excursion. You see I have grandchild named Gianna born June 17, 2008. She is OUR sixth grandchild and our 7th is in the womb!!! I nearly passed out!! I called my daughter, mother of Gianna, and she was amazed as I at the similarities! Anyway, I planned checking out more of your website. I belong to a Cursillo group that includes several 20something young women. They want to do Bible study but I have cautioned them to stay within the Catholic Church teachings of scripture. I almost left the Church through exposure to Bible studies outside the Church. It can be very confusing!!!! I was glad to see you have studies available on your website. I will steer them toward this!! Thanks again for sharing you life with us! Happy anniversary! May God continue to bestow blessings on you and your family. Your witness and your willingness to share your faith journey has been a true blessing to the Church! 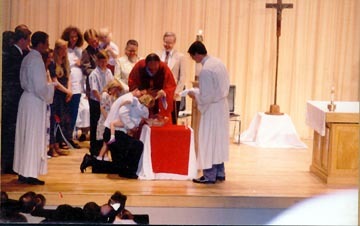 Today, Pentecost Sunday 30 years ago, my wife and I entered the Catholic Church. It has been an absolute blessing in our lives. If you’d told us 32 years ago that this would be where we were, we’d have laughed our heads off! God does work in mysterious ways!